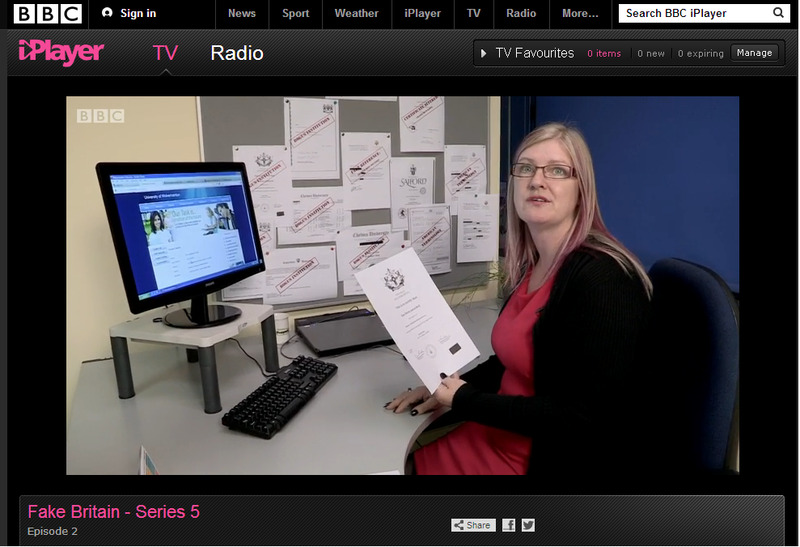 If you stuck around after BBC Breakfast today you will have seen the issue of fake certificates and degree fraud covered on the BBC1 consumer programme Fake Britain. it’s no longer on BBC iPlayer, but you can catch our segment on YouTube, if you missed it. It demonstrates the consequences of fraud and looks in more detail at the case of Julia Rawlinson, the Torquay ‘teacher’ we have mentioned before here on the blog. It discusses the effects on the pupils she was preparing for exams at the time when she was arrested and the possible consequences for them of not getting the grades due to their inadequate teacher. We talk to some current students about their views. We also show some fake certificates and expose the sophistication of the degree mills combining provision of fake documents with verification websites like the fake University of Wolverhamton where you can use the certificate student ID to get a verification online. It was an excellent example of clear, serious consumer journalism. Sadly our Rogues Gallery of fake certificates grows bigger by the week. The latest culprit is a mash up of one university’s name and the crest and signatures from another. On the one hand it’s great to catch the culprits, but depressing in the frequency of the occurrences. As we passed the milestone of 20,000 HEDD enquiries we took some time to look at some of the outcomes. Qualifications are less likely to be checked the further away from graduation day a candidate gets. Of the 20,000+ enquiries received since HEDD launched two years ago, 76% have been to check qualifications of those who graduated after 2000 and almost half are to verify graduates who left university within the last four years. Just 16% of enquiries were to undertake checks on those who graduated in the 1990s, and the number was halved (8%) for those leaving university before the ‘90s. Graduates who are further on in their career have more opportunity to blatantly lie, exaggerate or bend the truth a little more than their more recent counterparts simply because they are not being checked out. When someone has been working for a while, it’s common to assume that academic checks will have been made by previous employers. From a candidate’s point of view, qualifications can seem less important the further on in our career that we get. Higher classification degrees are much more common now and those who have been in the workplace a long time can feel under pressure with competition from the new wave of graduates who are regularly achieving a first or 2.1 degree. Perhaps they feel that the third class degree from a former polytechnic isn’t appropriate to the senior position that they are in and are therefore tempted to embellish. If someone is willing to lie at this level, how can you trust them when they become part of your organisation? It’s incredibly important that employers validate who they are recruiting, and not just rely on good work references to get the full picture of a person. BBC Education picked up the story today.